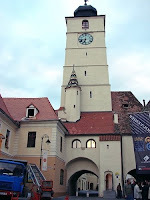 This is the famous clock tower my friends rave above when they visited Sibiu. It is also known to many as Hermannstadt, and on many signs both the Romanian and German names are posted. The most interesting aspect to the coat of arms of Sibiu is that there is the castle on the top. It is representative of the fortifications of this city. If you ever have a chance to go to this city, do so, the fortifications are amazing, and stunning. It is a testament to the people who built it and the people who lived there that they kept the city is such wonderful repair.